Billy Napier saw firsthand how the methods of Nick Saban turned Alabama into a powerhouse. Now he's bringing a smaller-scale version of that model to Louisiana and extending his late father's legacy as a head coach. LAFAYETTE, La. — An automatic lift, positioned behind the end zone and raised 30 feet above the field, gave Bill Napier the perspective of a press box. His 400-pound electric wheelchair may have prevented the normal climb to the apex of a high school football stadium, but it did not restrict his favorite hobby—calling offensive plays. So, seated in that wheelchair, high on that lift, Napier whispered his favorite plays into the microphone attached to his headset. Napier forced the words out of his mouth with difficulty, because by this point, many of his motor functions—including the knee-buckling handshake for which he was known—were already lost to ALS, the crippling disease that so unfairly seized his healthy frame years before. His wife, for instance, awoke a half-dozen times a night to carry out things Bill couldn’t: straighten his pillow or scratch an itch, walk him to the bathroom or turn him onto his side. But call plays? You betcha. He called plays as Dalton High School’s offensive coordinator until uttering anything was impossible. During the last few months of Bill’s life, his wife Pam searched for the perfect grave for her husband as dusk settled over Chatsworth, Ga. Matt was there with his mother, both of them walking side-by-side through a cemetery evaluating plots, one of life’s most uncomfortable ordeals, a son picking out his father’s final resting place. Finally, one struck him for no other reason than its location. From this particular grave site, Matt could see the lights of Murray County High’s football stadium, the place where his dad built a legacy, where he and another Napier son, Billy, learned the game. “It just happened to be a Friday night,” Matt says. Yep, he told his mom, this is the one. One corner of the new office is arranged with more significance than the rest. A national championship ring from Alabama’s 2015 team, the second and last title Billy was a part of in Tuscaloosa, sits on a shelf just above a photo montage of his father Bill, a legendary former high school coach in Georgia. 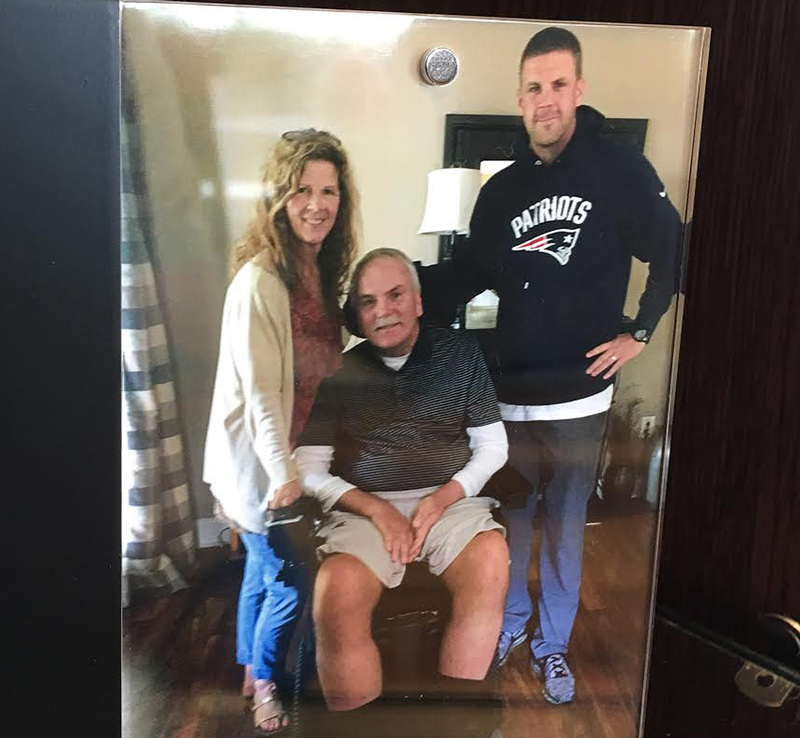 Bill battled ALS for five years before he died last September, just months after the neurodegenerative disease deprived him of the ability to speak and just days after football season began without him at the helm of an offense for the first time in decades. Bill and Bama are the two inspiring elements Billy is using to rebuild Louisiana into the Sun Belt championship contender it was a half-decade ago. Napier sold Maggard on the same Process that Saban implemented in Tuscaloosa, a system that Napier saw roar into action in 2011, the first season (and title) he experienced as an offensive analyst within the Alabama machine. Napier was so astounded by the amount of football personnel bustling about that he’d sometimes ask aloud, “Hey, what’s that guy over there do?” Billy calls 2011 the most valuable year of his career, when Saban picked him up “off the streets” the year after Dabo Swinney fired him as Clemson’s offensive coordinator. Napier spent the following season on staff at Colorado State, then returned to Alabama for four years as receivers coach from 2013 to ’16. By that point, Saban had crafted a one-of-a-kind college football assembly line, with dozens of staffers performing specialized tasks to engineer a championship final product. • The Saban Way: How Well Have His Assistants Fared as Head Coaches? On a hot July day, the additional staffers requested by Napier and approved by Maggard are moving about the school’s three-year-old football facility. One is organizing the camp schedule from behind a computer; others are scouting a 2018 opponent on a projection screen in a dimly lit room; another is barking at players as they lumber through conditioning tests. Napier says about 85% of what he is implementing in Lafayette is in the image of Saban’s program, but he has put his own twist on some items. He breaks up the calendar into eight phases: Foundation (the first two weeks of January), Identity (pre-spring training), Spring Practice, Discretionary (exams and exit meetings), Regimen (summer training), Fall Camp, In-Season and Postseason. “If you haven’t been around it, it’s hard to explain,” Napier says, which explains why Saban disciples are everywhere on Louisiana’s new staff: Hocke, Katie Turner (director of on-campus recruiting), Andrew Burkett (recruiting researcher and evaluator), D.J. Looney (assistant offensive line coach) and William Peagler (director of player personnel and quality control) all at some point worked either under Saban at Alabama or under Saban protégé Kirby Smart at Georgia. Some of their roles are still being determined, but they’re all here to help Napier establish what Saban did in Tuscaloosa, from directing the evaluation and recruitment of talented players to instilling the intangibles that Napier maintains separate Saban’s teams from others. The four-bedroom beach home is lively even in the early-morning hours. Six children scramble from the first to third floor, the three moms are lathering on sunscreen, and the aroma of freshly brewed coffee wafts from the kitchen. The three dads are talking football because that’s what these dads do, scribbling offensive plays on napkins, their only devices since their wives forbid them from bringing playbooks and whiteboards to the yearly Fourth of July vacation. Bill Napier had three sons, and now, wouldn’t you know it, they’re all football coaches. Billy made the biggest splash, ascending to the play-calling duties at Clemson at 29, which made him the youngest offensive coordinator in Division I football. Matt and Kurt are coordinators at the high school level in the family’s home state, Georgia, where their pop won more games at Murray County High than anyone before him. Matt got to hug and kiss his father last September just a couple of days before he passed at the age of 60, something that struck family members but didn’t shock them. The diagnosis in the summer of 2013 was the toughest for Billy, as he researched ALS and learned that the disease is a death sentence for which there is no cure, attacking motor neurons and gradually weakening the body’s muscles. Billy Napier, far right, poses with his father, Bill, and mother, Pam, for a photograph that sits framed in his office. Bill Napier was a “hero” to his sons. They grew up riding to his speaking engagements and football camps in his two-seat Datsun 280ZX, and they watched in the living room as he pored over VHS tapes of Tom Osborne’s Nebraska teams wrecking defenses with option football. Bill’s Murray County High Indians eventually did the same at the prep level, winning a school-record 94 games in 16 seasons. Many of the young men whose lives Bill changed as high school players rallied around their former coach in his final years. Billy says his father’s “core” emerged during that time, “verifying what I thought he was.” Bill took money a charity raised for him and created a scholarship program for players who weren’t in the mix for major scholarships to continue their careers at small colleges. Director of sports nutrition Bailee Sawyer stands in front of 100-plus football players and drives her point home. Before this year, Louisiana did not employ a nutritionist, Maggard says. 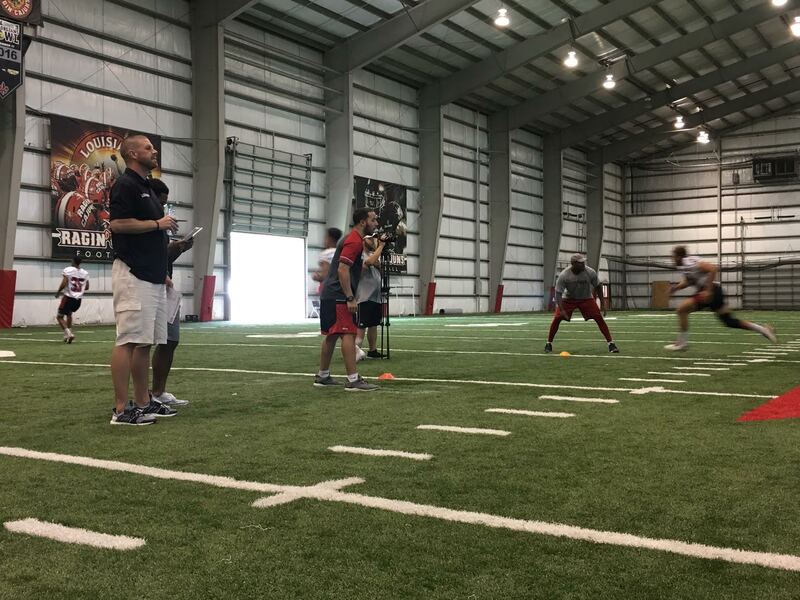 Its three-person department is now housed in an office off the weight room, all part of Billy Napier’s first steps toward replicating the Alabama Way. In his search to replace Mark Hudspeth, Maggard sought a coach with an established and proven system like the ones he saw firsthand as an administrator at Kansas State during Bill Snyder’s tenure and at Missouri for Gary Pinkel, a Don James disciple just like Saban. Louisiana’s athletic budget in the 2016–17 year was $28.3 million, about 16% of the Crimson Tide’s and ninth in the 12-team Sun Belt, but Maggard believes his program has the best facilities in its conference, aside from a football stadium that could soon see major renovations following a feasibility study. Geographically, the school is nestled in a talent-rich area—the state of Louisiana ranks seventh in producing Power 5 players over the past decade and third when factoring in population. Billy knows this place well from recruiting it during his days as a receivers coach for Saban. He sometimes avoided wearing his Alabama gear while recruiting in a state whose flagship program and its many fans hold so much hatred for the Tide. Now, instead of battling LSU on the recruiting trail, he hopes to land the next-best guys—the Tigers can’t get ’em all. That means fending off the bottom feeding Power 5 teams that dip into the state, but it also means heading outside of its boundaries. He wants to recruit a six-hour perimeter from Lafayette: north to Memphis, west to Dallas and east to, yes, Alabama. Billy Napier watches walk-ons participate in workouts inside Louisiana’s indoor facility. 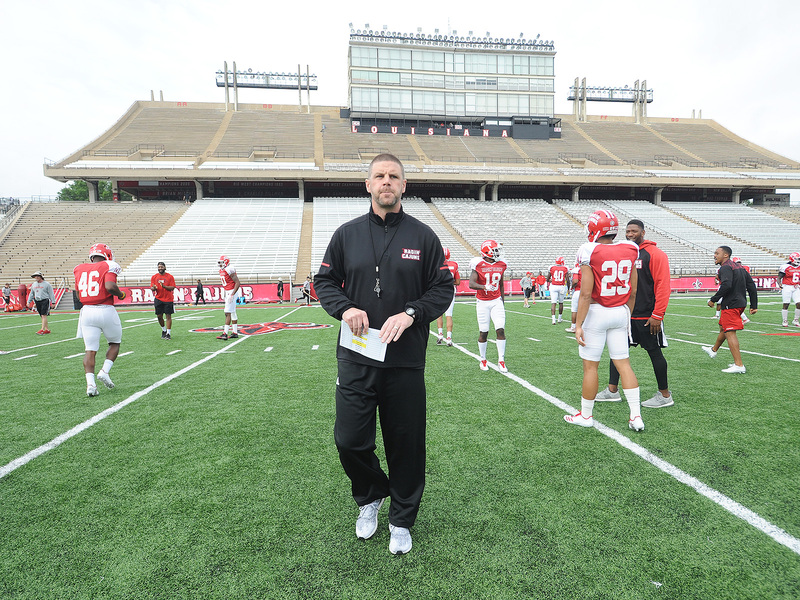 “Hit the lights,” Napier tells a student assistant and then gets to work, grilling his six quarterbacks on formation and coverage identification from a game between Sun Belt powerhouses Arkansas State and Troy. At times, the first QB to answer a question correctly gets to dole out a pushup or five to another player at the table. Napier is his own quarterbacks coach, and he’ll call the plays at Louisiana, “because it’s as close as I can get to playing again,” he says with a smile. When he took over Arizona State’s offense last season, Napier created an abridged version of Alabama’s elaborate system, a one-back spread offense with pro alignments that can operate at varying speeds. The offense’s run game is mostly derived from longtime Alabama assistant Joe Pendry, and its play-action passing game comes from Lane Kiffin’s offense. The scheme includes some Air Raid from his stint in 2017 under former Sun Devils head coach Todd Graham, and he borrowed Jim McElwain’s tactics for instructing and teaching passers, something on display during this quarterback meeting. Napier arrived to the meeting with his quarterbacks after watching more than 40 walk-on players exhaustingly trudge through conditioning tests. The best of them will make the 110 who participate in camp, the next best will make the 130 for in-season practice and the others will be cut. Billy, an assistant at his hip, watches intently while scribbling notes. Napier’s new team meets its role model on Sept. 29, when apprentice travels to Tuscaloosa to play master in an affair that was scheduled in 2016. The game will come two days after the first anniversary of Bill Napier’s death. Billy knows it will not be easy to see the shadows of his two inspirations collide in the same week, but there is a consolation. Did the LSU-Alabama Rematch Really Kill the BCS?